I cooked up some black beans the other day. I froze half for later and put the rest in the refrigerator to think about what I wanted to do with them. I could have made Ten-Minute Black Beans with Tomatoes and Cilantro, a recipe I got from my sister which is fast, easy and delicious and which I will someday share with you. 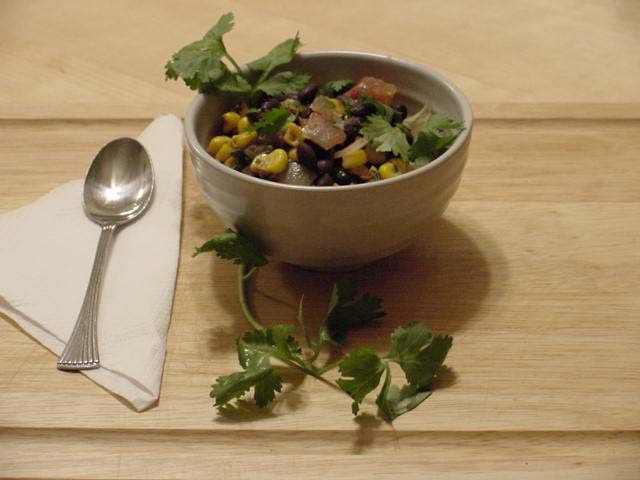 Or I could have made Southwestern Black Bean Soup, or Caribbean Vegetable Stew, or some other more complicated recipe. But I wanted something I could throw together fast and I don't want to get tired of the Ten-Minute Black Beans and I've been making them a lot lately. I had some Trader Joe's roasted corn in the freezer. I love black beans and corn together. And we had been talking about lime-cilantro rice at the knit shop the other day, which reminded me I had made up a lime-cilantro corn dish a couple of weeks ago. It seems like I was starting to get the shape of what I was looking for. So I made up this lovely dish. I'm calling it Black Beans and Corn with Lime and Cilantro. Not very original, I know, but it does the job, descriptively speaking. Heat oil in large skillet over medium heat. Add onion and saute for approximately two minutes. Add garlic and salt. Saute for approximately five minutes more. Add tomatoes and cayenne and simmer for five minutes. Add black beans and corn and cook approximately ten minutes, until heated through. Take off heat, stir in lime juice and cilantro. Serve immediately. I made this yesterday, Debi and it was wonderfu...picking up on the mangoes in whipped cream (see post above) I kept thinking I wanted a bite of mango to go with it. I still have time. This will last a few days.